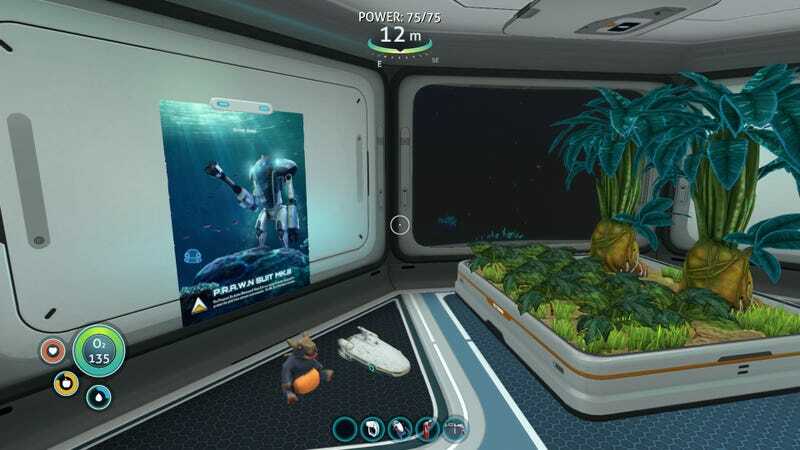 My tiny Subnautica base. I probably shouldn’t leave the toys on the floor, but I don’t have any tables. The weekend is for having finally bought a casserole pan and being really excited to casserole some things. Or just make brownies in it. The weekend is also for playing video games. I cannot stop playing Subnautica, even though I’ve hit a bit of a snag progressing in the story. I’ve been too scared to go deeper into the ocean, tending to strike out a bit aimlessly and then having to scurry back to my safe base in the shallows. This weekend, I’m going to make a bunch of beacons and try to map out the different areas I’ve found, invest the resources to upgrade my vehicles, and steel myself to descend into the terrifying darkness. One of the things I really like about Subnautica, at least in survival mode, is that the penalty for death isn’t that severe. When you die, you just lose the resources you’ve gathered since you last stepped foot in a vehicle or base. It can be a little annoying, but not game-ending, and I’ve seen players recommend counteracting it by building little bases in areas you’re unsure of so you can ‘save’ your progress before you explore. This means I could push myself more, which is what I’m going to have to do to find out what the heck is going on around this watery planet.